and delete files from the list. A basic application created using Backbone comprises of a view, a model and a collection. Let us now discuss about an example that consists of all these three elements. However, to make it more interesting we will also use a Backbone.Marionette.CompositeView (i.e. GridView) extension rather than using a Backbone.View only. The models will be utilized and provided by Backbone.Model and collections by Backbone.Collection. In the above example, as you can see we’re creating an instance of Backbone.Collection. And because the GridView is instantiated with the variable fileCollection, it will auto-update the view at the time when the model or collection is changed. Lastly, we’re appending the GridView’s element to the document object model (DOM). The sub-models, files collection and sequence of the uploaded files will be instantiated by the app class. The models and collections in Backbone framework includes a built-in implementation of the REST services. When we call the fetch() function on the fileCollection, a GET request to files.json is made. In addition, it will populate the collection. What’s more? Every entry will act as an instance of Backbone.Model. In order to fetch through the hash options, you can pass success as well as error callbacks. Additionally, you can even subscribe to the “sync event on the collection”. This is action will be triggered whenever the collection will sync with the server successfully. A destroy method is provided by Backbone.Model. On calling this method a DELETE request is triggered to the REST API automatically. This will get rid of the item in question. In order to trigger the request two conditions need to be completed: we’ll have to define the model urlRoot property, and it is compulsory for the item to have an “id” attribute. Just like the sync and fetch events, an option hash can be passed on to the destroy method. This will provide custom callbacks or else a relative URL will be provided for the DELETE request in case of our example, as follows. Not to mention, a user action will trigger the deletion of the items. In the following code, you can see that a GridView is set up, which will help in handling the “click events” on a DOM element. Backbone comes loaded with built-in functionality that helps to accelerate web development, including REST support, jQuery-like event binding etc. Backbone also helps teams of developers maintain a clean code base. Also, the Backbone framework help developers to keep a clean app code base, as it helps in determining the structure of the application. The downside to using Backbone is that it has a steep learning curve and is difficult to understand. And so, using it for creating a small app can make your less flexible. In simple words, Backbone is an ideal framework for creating large-size application. 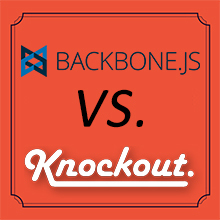 Knockout is fairly easy to understand and can be set up in a simplified manner, allowing to develop an app quickly. It boasts a two-way data binding mechanism that helps to synchronize your model with the UI. Also, it helps in making the code clean, as it provides a separation of the view and the business logic. However, Knockout isn’t the best choice when it comes to structuring the application, as it emphasizes on data binding only. Thank you John for your valuable comment.